Please send your samples in small boxes instead of envelopes to protect the samples from being crushed during shipment. We offer ultrafiltration subsequent to conventional collagen extraction methods. Note – Fees are inclusive of d13C measurements, d15N measurements (except cremated bones), quality assurance reports, calendar calibration when applicable, and 24/7 web access to past results and pending analyses. Additional fee is charged for collagen or bone carbonate extraction. The d13C and d15N ratios are measured using an isotope ratio mass spectrometer (IRMS). We may not be able to provide d15N measurements for charred or heated bones depending on the sample quality. Please contact us before submitting heated bones. Beta Analytic also provides %C, %N, and C:N values at no additional cost for non-cremated bones submitted for AMS dating. Pretreatment – It is important to understand the pretreatment applied to samples since they directly affect the final result. For bones, we provide conventional collagen extraction techniques and subsequent ultrafiltration methods if requested. If you require ultrafiltration, please contact us before sending your samples. Please use this contact form to inquire on radiocarbon dating prices. When requesting for an estimate/quotation, please provide the currency, number of samples, service requested/turnaround time (AMS standard or priority), type (non-heated, fully charred or cremated bones) and the billing address. Bones – Good cortical bone is best from the larger bones of the body (femur, tibia, upper arm bone, jaw, skull plate and sometimes the ribs). Spongy bones like ball and sockets, vertebra, and the like do not tend to preserve well in harsh conditions and may not yield sufficient collagen for AMS dating. For bird and fish bones, please consult the lab for sufficient sample size. Teeth – For human teeth, preferred samples are single complete incisor or canine. If sending a molar, all 4 roots must be attached. For animal teeth, the sample size depends on the animal. For large mammals, 1 tooth is sufficient. For small animals, please consult the lab regarding the appropriate quantity. Antlers – Chunks, chips, and shavings are best for radiocarbon dating. If your samples are already powderized, please contact us for discussion. We accept extracted bone collagen for radiocarbon dating. However, the material will be listed as “organics” in the final report instead of “bone collagen.” This is due to the requirement by our ISO/IEC 17025:2005 accreditation that if we did not perform the chemical pretreatments and/or extractions, we cannot specifically testify as to the material that was dated because certain steps affecting the sample quality have been outside of our control and scope of our accreditation. Do not place extracted collagen directly into Ziplock bags. We recommend wrapping the sample in Aluminum foil or using a plastic or glass vial with a screw top before placing in a Ziplock bag. The organic content of enamel is too low for Carbon-14 analysis. We analyze the carbonate fraction when dating enamel. One tooth is sufficient for AMS dating. Bones submerged in water or wet sediments – Please consult the lab before sending these bone samples. Water is very effective in leaching the collagen proteins out of the bone, leaving only bone carbonate. Thus, it’s possible that the bones have very limited collagen. Bones that have been drilled or powdered prior to submission to the laboratory may not lend themselves to a robust pretreatment that can ensure the accuracy of the results. We DO NOT recommend that bones be drilled or powdered prior to sending to our laboratory. Bones that have been drilled or powdered prior to submission must be cleaned of any adhering or invasive contamination prior to the drilling or powdering. This many times requires both physical abrasion of the surface and chemical treatments. The pretreatment of non-cremated bone samples starts with the extraction of collagen, which is the material that is dated. Assessment of quality is supported by visual observation of the collagen and its extraction. The bone sample is first tested for friability (“softness”). Very soft bone material is an indication of the potential absence of the collagen fraction (basal bone protein acting as a “reinforcing agent” within the crystalline apatite structure). To assess the quality of the preserved collagen, the sample is demineralized in dilute/cold acid to eliminate all apatite and carbonate after physically or chemically removing the outer exposed surfaces. The collagen is then dissected and inspected for rootlets. Any rootlets present will be removed when replenishing the acid solutions. At this stage, the lab will perform a thorough visual inspection of the collagen quality. If the collagen is in poor preservation condition, the lab will contact you for discussion before proceeding further. If the collagen passes visual inspection, sodium hydroxide (NaOH) is applied to remove humic and exogenous organic contaminants. This step is usually highly destructive to the collagen but provides a clean sample for radiocarbon dating. After a final acid wash, the collagen is dried and measured for d13C. If the d13C result is reasonable, we proceed with the AMS dating. If it is not, we contact you before proceeding further. Collagen extraction can be done with or without alkali. “With alkali” refers to additional pretreatment with NaOH to ensure the absence of secondary organic acids. “Without alkali” refers to the NaOH step being skipped due to poor preservation conditions, which could result in removal of all available organics if performed. Ultrafiltration consists of filtering the collagen through ultra fine filters at high revolutions per minute as an additional measure to remove humic acids. Additional fees apply if ultrafiltration is selected; contact us for details. Note – Ultrafiltration will not always improve the accuracy of a radiocarbon date. This additional pretreatment “fractionates” the carbon in the sample. The theory is that the humic acids will pass through the filter, leaving the collagen behind. Depending upon the state of preservation of the collagen, this theory does not always apply. Samples that have undergone ultrafiltration have been shown to produce dates that can be both older and younger than those following collagen extraction with alkali. The unique burial, preservation and contamination conditions of a bone will determine the usefulness of this additional pretreatment. If you are unsure which category your bone samples belong to, please send them to our radiocarbon dating lab. We will examine them and advise if they are datable and by what technique. Bones that have undergone low-temperature heating (lower than 600°C) usually show black, blue or gray patches on the exterior surfaces or in the interior, indicating that all the fats and proteins have not been burned away and thus the osteocalcin has not been completely converted to structural carbonate. The degree of heating and burial conditions will ultimately determine whether a heated bone can be dated by AMS. It is not possible to predict what will be recovered from a heated bone. On occasion collagen suitable for dating may still be available. On other occasions, organics may be recovered but not identifiable as collagen. Analysis on these “residual bone organics” can yield reasonable AMS dates, but caution should be taken with their interpretation. No cancellation charges are applied if a heated bone is deemed unsuitable for dating after pretreatments. High-temperature heating can be a useful event in the history of a bone sample. If it was hot enough to char the collagen, the carbon in the bone will be very stable, resistant to contamination, and readily removed by full treatments with acid and alkali, as would be applied to a charcoal sample. Bones that are completely charred inside and out look like a chunk of charcoal. These are usually charred in very low oxygen, less than 600°C environments over a long period of time. The osteocalcin has been burned away leaving only the charred fats and proteins (collagen) behind. These types of burned bone can usually be dated but the pretreatments may be limited to acid leaches to remove carbonates. Many times they are too fragile to allow for alkali extractions to remove humic acids that may be present in abundance in the area of collection. Whether or not a charred bone will yield a radiocarbon date depends on the degree of charring. Bones that have been heated in low temperatures present special considerations. Bones with charred protein can be very good samples for AMS dating. In this case, the carbon is resilient to decay and can be fully pretreated in the laboratory. If the protein is partially charred, it is probably damaged and highly susceptible to decay. It usually cannot be fully pretreated (or identified as protein) in the laboratory. Generally, if the bone is bleached white throughout, charred collagen is not available. If the bone is black or blue, there is some chance it can be dated using a charred collagen remnant. The only way to know is to do some pretreatment. No cancellation charges are applied if a charred bone is deemed unsuitable for dating after pretreatment. A bone that has not been heated is pretreated by extraction of the collagen proteins. This is the most reliable material that can be dated for non-cremated bones. Preservation and quality of the preserved collagen is very important. This can be assessed during pretreatment. If collagen quality is good, pretreatment continues (acid/alkali/acid washes). If collagen quality is poor, the lab consults with the client for cancellation of the analysis. After the initial evaluation of the collagen, it is dried for Carbon-13/Carbon-12 ratio analysis. If the result of this analysis is reasonable, the lab proceeds with AMS dating. If the d13C result is poor, AMS dating can be cancelled at the request of the client. 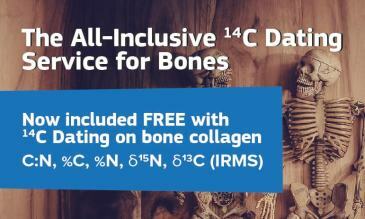 No cancellation charges are applied if a bone is deemed unsuitable for dating after pretreatments. These are bones that have been heated in excess of 600°C for sufficient time to burn away all of the collagen, fats, and proteins. These bones are typically white in color; and if broken into two, they are completely white on the inside as well. When bones are heated above 600°C, the osteocalcin (apatite) in the bone is converted to structural carbonate. This is the bone carbonate that is dated. The structural carbonate is very resistant to change and not easily contaminated once cremation has occurred, therefore it has been shown to be a good substance for reliable AMS dating. In the absence of any charred collagen, a method is available for dating the carbonate fraction in cremated bones. The method was published and accepted in 2000 at the 17th International Radiocarbon conference. Studies indicate good agreement between bone carbonate in highly heated bones with associated charcoal. This method should only be attempted in the absence of collagen or charred collagen. 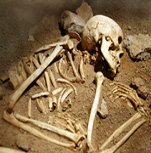 Recent studies have also shown that carbonate yields from separate sections of bone may be indicative of incomplete cremation. To test this, two portions of the bone are tested for carbonate yield. If they are similar, the lab proceeds with AMS dating. If the carbonate yields are dissimilar, the client can cancel the analysis or continue with AMS dating of both portions to test for similar age (incurring the cost of two analyses). Dating the carbonate fraction in cremated bones is recommended in the absence of collagen or charred collagen. However, caution is advised since the complete removal of contaminating carbonates cannot truly be assured. If removal of all carbonates was achieved during the heating process, the remaining calcium oxide may have reacted with carbon dioxide from the fuel. In this case, the possibility of the old wood effect from the fuel should be taken into consideration.